There were butterflies in Sam Brunelle’s stomach a year ago as she prepared to travel to Argentina. As a member of the USA Women’s U16 National Team, Brunelle was on her way to compete in the 2017 FIBA Americas U16 Championship. She had high expectations that this would go better than her first international tournament. One year earlier, in 2016, the Ruckersville, Virginia, native had been a part of the USA U17 team at the FIBA U17 World Cup in Zaragoza, Spain. But, being a 15-year-old on that team, Brunelle averaged just two minutes per game, and she and her teammates returned home disappointed after falling short in the semifinals, ending up with a bronze medal. Argentina and the 2017 FIBA Americas U16 Championship provided an opportunity to do better, and Brunelle was determined to make that happen. Playing with a much different team, she found herself to be one of the most experienced players on the roster and able to provide some leadership. She accepted an equally important role on the court. 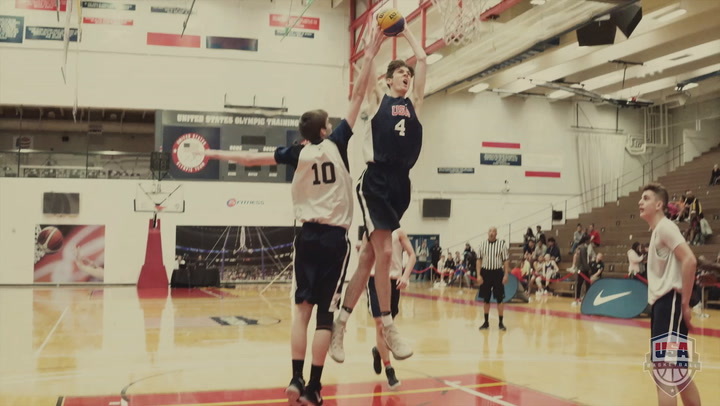 A 6-foot-2 forward, Brunelle started all five games in Argentina and finished the tournament as the USA’s second-leading scorer with 11 points and seven rebounds per game. Brunelle returned to USA Basketball this pst July fresh off being named the Gatorade Virginia Player of the Year following her junior season in high school. She once again played in the U17 World Cup, held this year in Minsk, Belarus, July 21-29. Adding another gold medal was the obvious goal, but she also has more intangible goals on her list. With her experience, she hoped to provide leadership and help her younger teammates feel as comfortable as possible, whether it was while they were going through training camp in Colorado Springs, Colorado, or facing the best teams in the world at their age level in Europe. Rolling to a 7-0 overall record, the 2018 USA U17 World Cup squad claimed gold. Having that gold medal on her resume has certainly helped her feel more confident and at ease compared to this time last year. That expanded leadership role especially showed last summer. Not long after the players returned home from Argentina in 2017, Hurricane Harvey hit Houston and other areas along the Gulf Coast. Flooding devastated some areas of Houston, and it hurt Brunelle’s heart to see it happening from a distance. Several of the teammates she has played with in USA Basketball, including Charli Collier (Mont Belvieu, Texas), lived in the affected area. Brunelle wanted to do something. So she launched a basketball camp for kids called “Hoops for Houston” to raise money for victims of the flooding. It allowed her to fulfill a dream of helping kids get involved in the sport, and it also helped her feel like she wasn’t just sitting back and watching the misery unfold in Texas. The camp raised $4,000, which was donated to a school district in the Houston area. “I was really happy,” said Brunelle, who has committed to play college basketball next fall at the University of Notre Dame. She said she chose the school because of its family feel. Brunelle is the son of a high school principal (mom, Katie) and a realtor (dad, Rod). She was raised with the expectation of high achievement in the classroom before getting on the court. Her mom also was a high school basketball coach, which is how Brunelle came to love the game so much. Did she ever get sent to the principal’s office? “I only go there for lunch,” she said. Down the road, Brunelle dreams of one day representing her country on the ultimate international stage at the Olympic Games. In the meantime, she’s taking advantage of another opportunity with USA Basketball. She teamed with Aliyah Boston, Paige Bueckers and Hailey Van Lith (all 2018 fellow U17 team members) to win the USA Basketball 3x3 U18 National Championship in April, and the four are currently representing the USA at the 2018 Youth Olympic Games that are being held Oct. 6-18 in Buenos Aires, Argentina. Compiling a flawless record 4-0 in Group B preliminary play at the Youth Olympic Games and earning a first place finish in Group B, Brunelle and her teammates will continue to pursue their gold medal dream and play Tuesday vs. Netherlands at 2 p.m. EDT in the medal round quarterfinals. A win will advance the USA foursome to the Oct. 17 semifinals.